Zurich Life is the first company in Ireland to pilot wearable technology to support customer health goals. 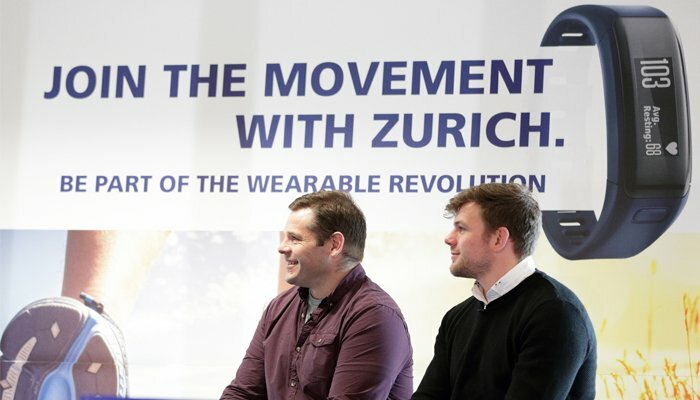 Zurich Life will become the first company in Ireland to incorporate cutting edge wearable technology in a pilot scheme, to support the health goals of its life insurance customers. The trial initiative, which will be available to a limited number of customers through selected financial brokers, will see customers rewarded with cashback on their premiums for meeting certain health goals. Under the pilot, certain Zurich Life customers taking out a life insurance policy will receive a free Garmin Vivosmart HR device. A customised app, developed with Garmin and Hintsa Performance to complement the device, will be used to register and engage participants and monitor fitness goals relating to things like footsteps and heart rate. Based on the data, Zurich will be able to reward customers with cashback, to support their fitness achievements. Evan Hanley, Product Solutions Actuary at Zurich Life commented: "We're delighted to work together with Garmin and Hintsa Performance, to bring this cutting edge technology to the life insurance market. The scheme will not have any impact on our customers' premiums, underwriting or claims - the aim is to support customers to become healthier and more active, and claim cashback rewards if they continue to engage with the pilot. It will also create an opportunity to assess the role of wearable technology for insurance in Ireland into the future and to see if it leads to greater customer engagement." Jussi Räisänen, Co-Founder and CEO at Hintsa Performance added: "At Hintsa, we're passionate about unlocking human potential and enhancing the everyday life and performance of people. This cooperation with Zurich Life and Garmin will create new opportunities to motivate participants to incorporate a healthy mentality into their daily routines, and keep their fitness and wellbeing goals top of mind. We have witnessed more than 70% of people using our digital tool change their lifestyle choices for the better. We're excited to be part of this pioneering initiative, and are looking forward to seeing what it can deliver for Zurich's customers." The pilot programme will run over a two year period, with participating customers helping to advance innovations around technology in Ireland's life insurance market. Provided participants pay their monthly premium and maintain an average number of daily steps, we will reward them with four months premium cashback at the end of year one and two months premium cashback at the end of year two (terms and conditions apply - for further details please see the customer brochure). Hintsa Performance is a human high performance company that offers science-based coaching services and scalable digital tools to improve the life and performance of individuals, teams and entire organisations. Over the past 20 years, Hintsa has grown to a multinational company that serves a clientele ranging from Formula 1 World Champions and top CEO's to executive teams and employees in hundreds of companies around the world.